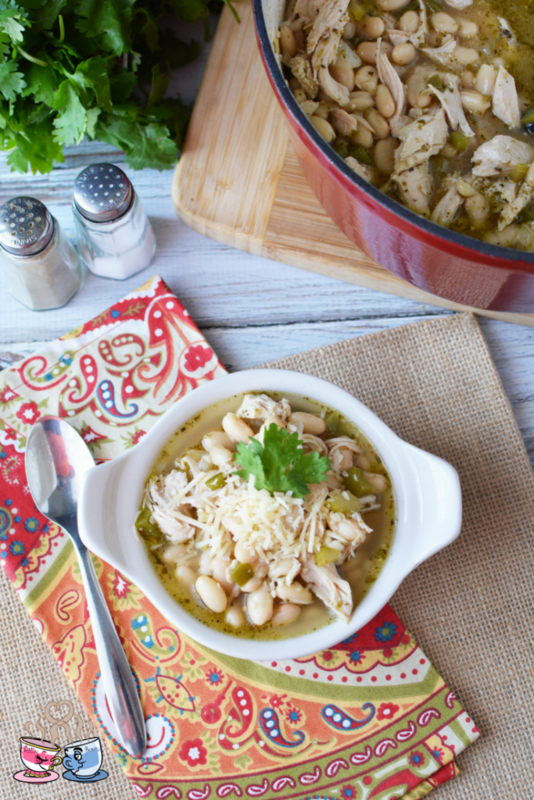 White Bean Turkey Chili sounds like a delicious recipe that is perfect for the cooler months. Since I am eating a plant-based diet, my friend Kari from over at Craft Create Cook made this one and shared with us. She said it was delicious and even got a thumbs up from her neighbor. This post contains affiliate links from Amazon. I earn a small commission on purchases made via these links. 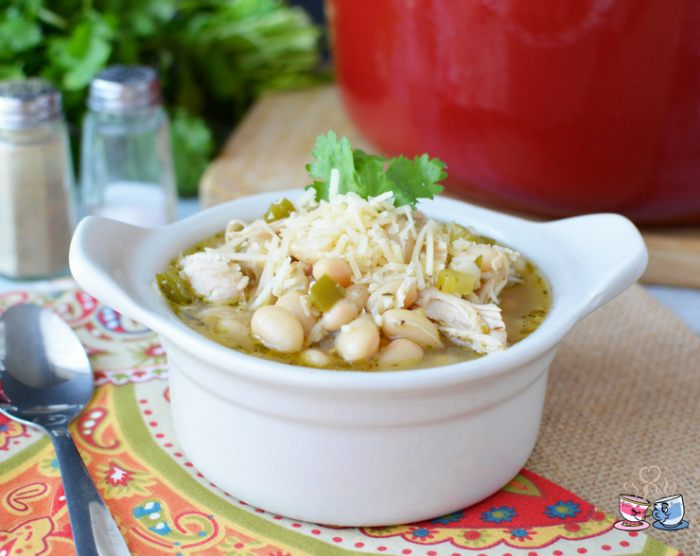 This easy white bean turkey chili recipe is a perfect way to use up leftover turkey around the holidays. It gives a different flavor profile to the leftover meat and also provides you with a healthier meal that is delicious. I love making chili in my Instant Pot, but this recipe is a stovetop variety that works great in a nice cast iron dutch oven. In a large stock pot or dutch oven, add onion, green pepper, celery and olive oil. Cook on medium-high heat until onions are translucent and peppers are tender. Stir in garlic. 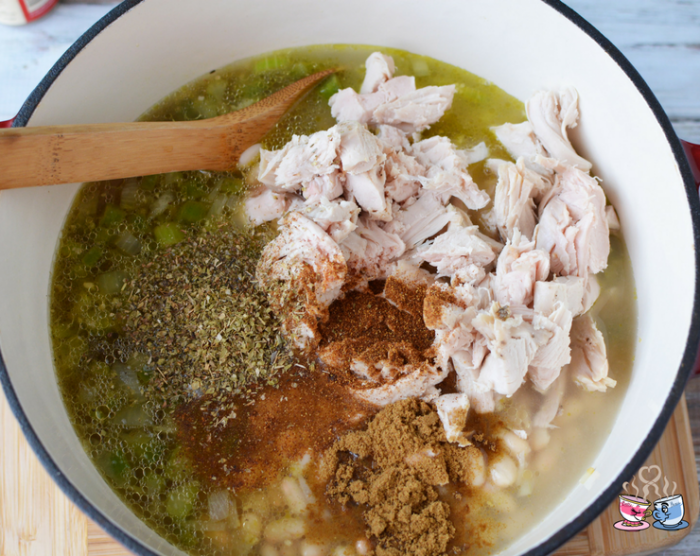 Add chicken broth, beans, and turkey and mix well. Stir in seasonings. Heat to boiling then reduce heat to simmer and cover for 30-60 minutes, stirring occasionally. Serve with sour cream, cheese, and cilantro. Heat to boiling then reduce heat to simmer and cover for 30-60 minutes, stirring occasionally. 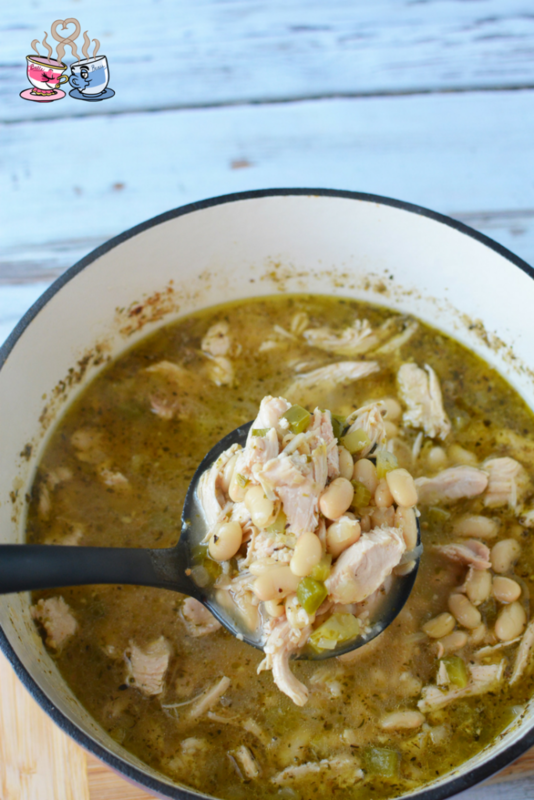 If you prefer using your Instant Pot, this recipe would work great for a faster meal. Using the saute feature, cook onion, green pepper, celery and olive oil until translucent. Add in all ingredients, and set cover to seal. Cook on soup setting for 20 minutes. NPR for 5 minutes. Alternately, you can add all ingredients to a freezer bag, label and date, then remove from the freezer to thaw the night before you wish to cook. Cook on low heat for 4 hours in your Crockpot. 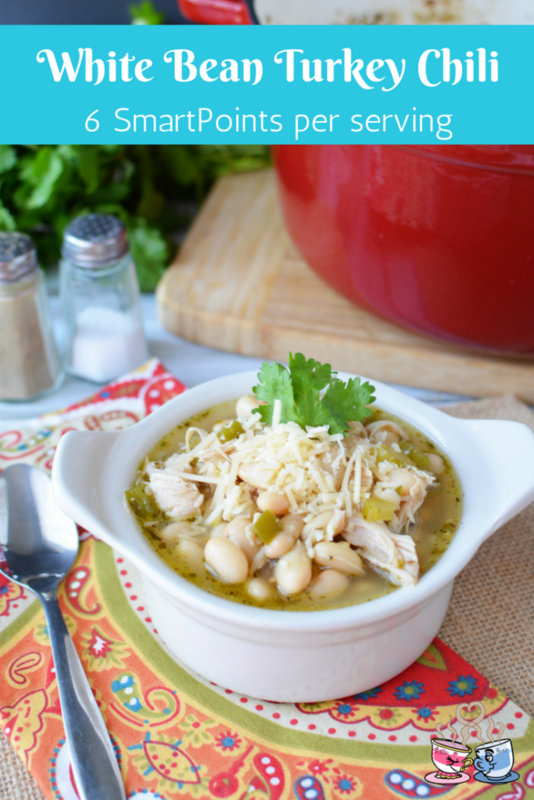 Make this white bean turkey chili recipe for a healthier choice on those fall and winter nights when you feel the need for a warm cup of soup. If you prefer to make large batches of soup and freeze for meals later down the road, you can easily do that with this recipe. You can choose to cook it, cool, and portion into containers with the date and name of the recipe. This is going to be a great recipe you’ll love! This sounds delicious! Thanks for sharing on the What’s for Dinner link up – Would love it if you would comment there! Sounds deliicious and a great way to use all the leftover turkey. 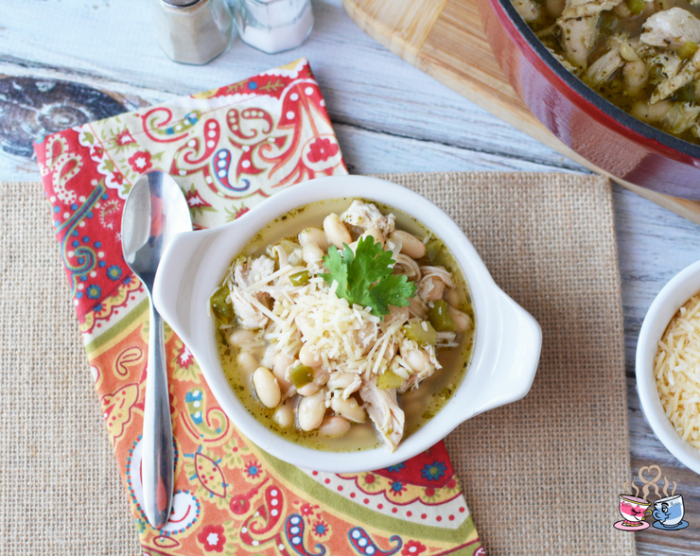 We will really enjoy your White Bean Turkey Chili! I really appreciate you sharing your awesome post and your talent with us at Full Plate Thursday. Have a great weekend and come back soon! Looks mouthwateringly delicious! Thank you for bringing it along to Fiesta Friday! Do you drain the beans? Chris – it isn’t necessary to drain the beans. You can if you prefer less liquid in the chili. Is it ok to use leftover chicken?? For the white bean turkey chilli! DO you have to use all the spices? We prefer using all of the spices for the best flavor. If there is one you have a specific issue using, let me know and we can try to come up with a substitute that works well for you. Oh my yumminess!! 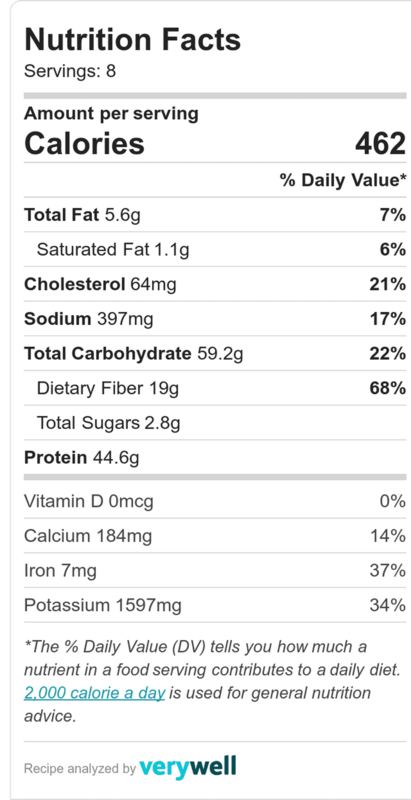 I had two servings (2Sp) but I was STUFFED!! It has the best flavor and was even better after sitting in the fridge for a day. I mixed in some cilantro (cause why not) and Gave some to my fiend! Thanks for the tasty recipe!! As the printable option shows, just cook for 30 minutes to 1 hour.